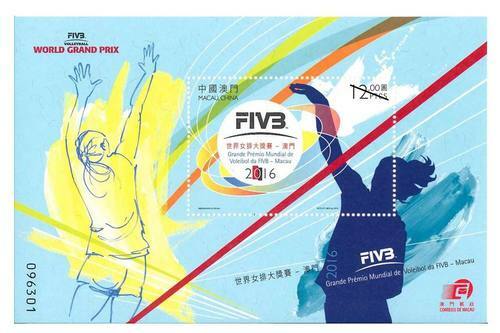 Stamp Issue "FIVB Volleyball World Grand Prix™ – Macao 2016"
The FIVB Volleyball World Grand Prix™ Macao 2016 is held from 17 to 19 June at the Macao Forum. 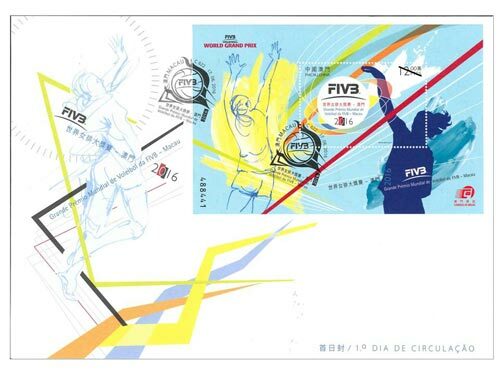 As one of the legs of the FIVB Volleyball World Grand Prix™ 2016, four elite women’s volleyball teams – China, Brazil, Belgium and Serbia – compete in the event and demonstrate their skills to Macao citizens and volleyball fans worldwide. 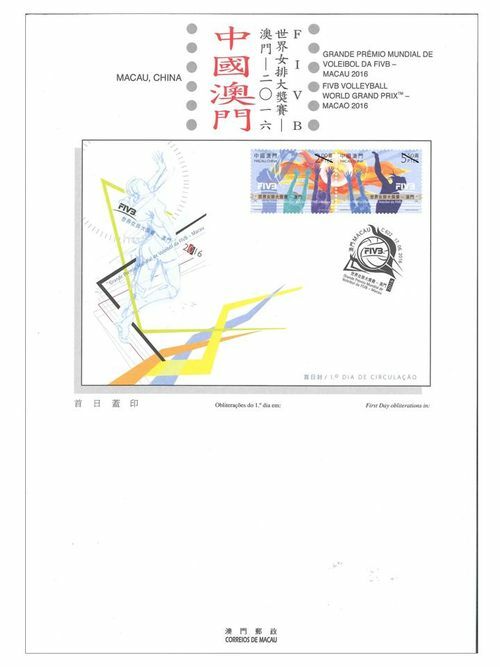 To mark this event, Macao Post will issue the stamp theme “FIVB Volleyball World Grand Prix™ – Macao 2016” on 17th June, 2016. 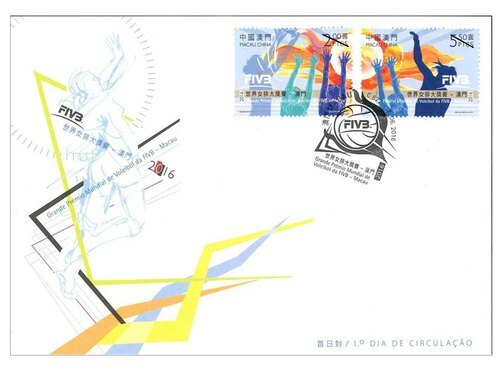 This issue includes a set of two stamps and one souvenir sheet, the souvenir sheet is applied with embossing effect to highlight the theme of volleyball. 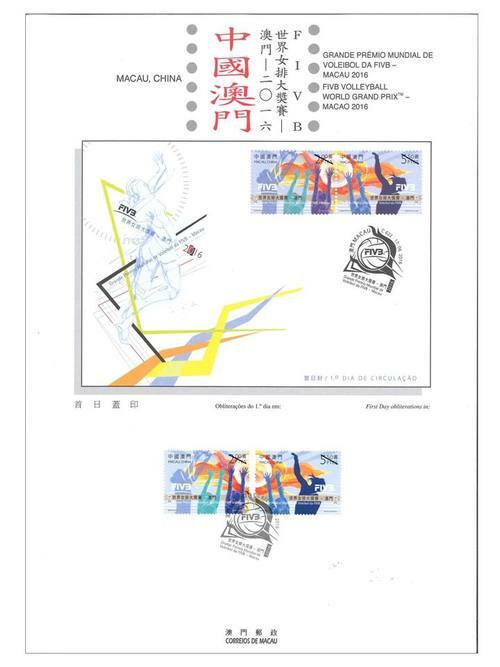 The stamp designer of this issue is Ms. Helena Man In, Ng, and the text of the information brochure is written by the Sports Bureau of Macao Special Administrative Region Government. This is the seventh theme in 2016. 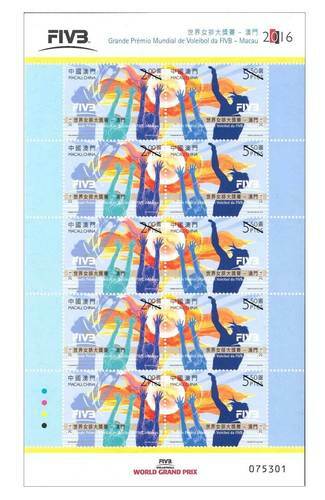 The previous issued stamps are “Lunar Year of the Monkey” on 22/01/2016, the label stamp “Lunar Year of the Monkey” on 22/02/2016, “Scenery of the Imperial Palace in Beijing” on 01/03/2016, “325th Anniversary of the Establishment of the Public Security Police Force” on 14/03/2016, “Chinese Classical Poetry – Ballad of Mulan” on 08/04/2016, “Macao Seen by Chan Chi Vai” on 28/04/2016, and “Museums and their Collections V – Maritime Museum” on 18/05/2016. 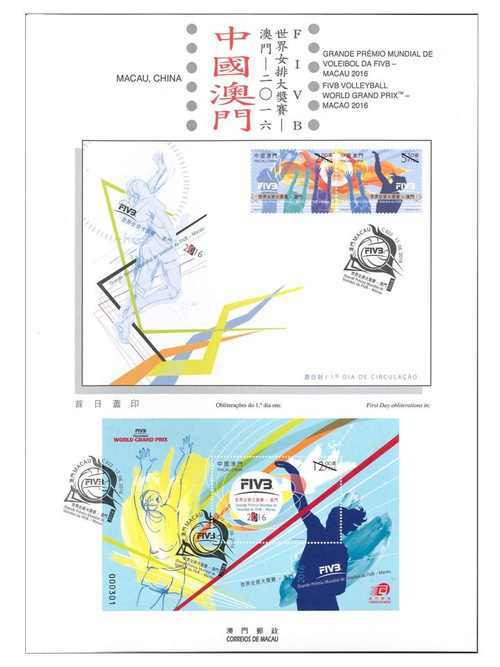 Technical Data of Stamp "FIVB VOLLEYBALL WORLD GRAND PRIX™ – MACAO 2016"